Since the boys were going to have some fun camping out, Sarah and mom decided to have some fun of their own. 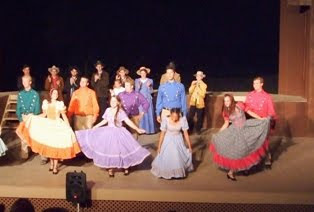 We went to see Seven Brides for Seven Brothers at the Starlight Mountain Theater in Garden Valley with Nancy and Emily Hansen. We had SO much fun and LOVED the whole evening!! We hope to make it our tradition and go every year when the boys go on their campout!! 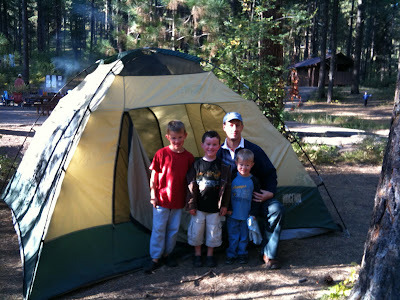 A few weekends ago, Nathan took the boys to Greyback Gulch Campground for our ward's Father Son Campout. They brought hotdogs to roast and s'mores to make over the campfire. Andrew's favorite part of the campout was that they told ghost stories around the campfire until past midnight and that they (Andrew and Nathan) were some of the last to go to sleep. 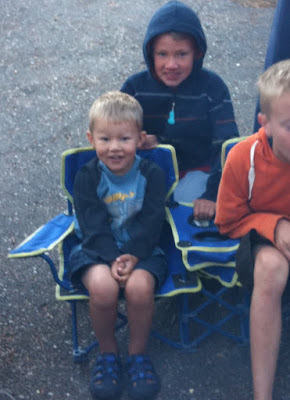 I heard that Spencer fell asleep in his camping chair and Benj put himself to sleep in the tent sometime around 8. They had a great time and luckily all had naps the next day! !